THE SHAPED PAINTINGS from 1974 to 1981 took the relation between internal layout and external shape to a new level of interaction and complexity. Drawing came to the fore without any sacrifice of color. In his earlier series -- even in the "Needle Diamonds" -- drawn edges had a logical relation to internal divisions. In the '70s "Shapes" there's more of an equivalence, a stronger and more expressive interaction that recalled the asymmetry of the "asymmetrical Chevrons." Since the advent of easel painting in the Renaissance, painting had been dominated by a vertical or horizontal rectangle, organized in relation to its stability and symmetry. Noland's shaped paintings broke away from that rectangle. The "Shapes" were inherently unstable, but re-established stability through internal color relations. In the "Irregular Shapes" (1974-79) internal drawing determined the picture shape in some instances while in others it responded to it. The external shape was at first drawn in response to internal divisions, often radiating bands or rays. By the time of the "Surfboards" (1979-81) the picture shape was imposed by a series of predesigned templates. 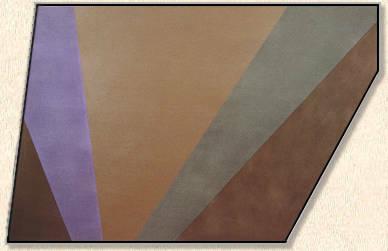 The "Surfboards" were Noland's last paintings in flat, unlayered color and summed up the relations between color and shape that had dominated his art to that point. Done on an intimate scale, roughly the size of an upright person, they recall the concentration and tension of the "Needle Diamonds." from a decade earlier. Where Jules Olitski and Lawrence Poons from the same period used narrow formats to contain rather monochromatic surface variations, here Noland used panels of flat color enhanced by color fringes and stamped out by irregular shapes. Just big enough to "contain" a human figure, the "Surfboards" embody color expression against the wall as a refined presence.